– it’s serious fun and that’s official! 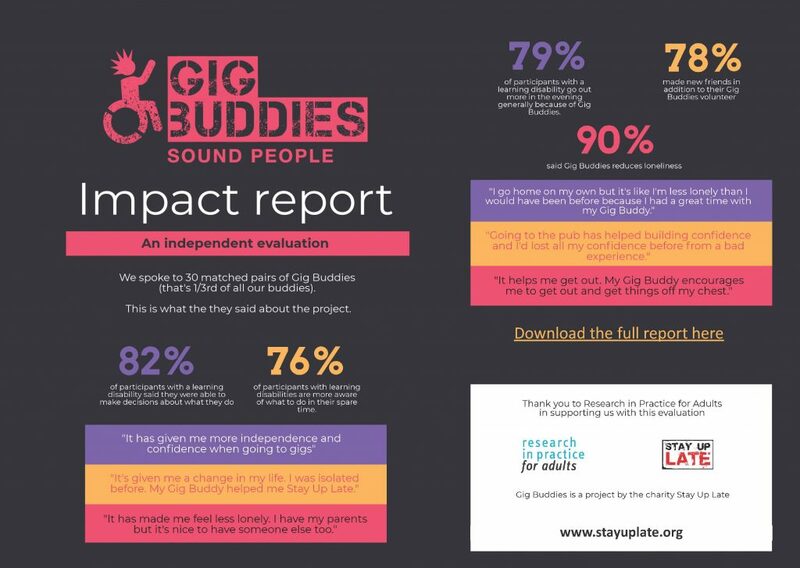 Last year we were delighted to work with Research in Practice For Adults (RiPFA) who conducted our external Gig Buddies evaluation project. This article is from our main charity site at Stay Up Late and you can read more about the findings from the evaluation below. They interviewed 30 of our Gig Buddies pairs to find out if the project was meeting the main outcomes we were seeking to address through our Big Lottery Reaching Communities funding. People with learning disabilities are less lonely and have more friends. 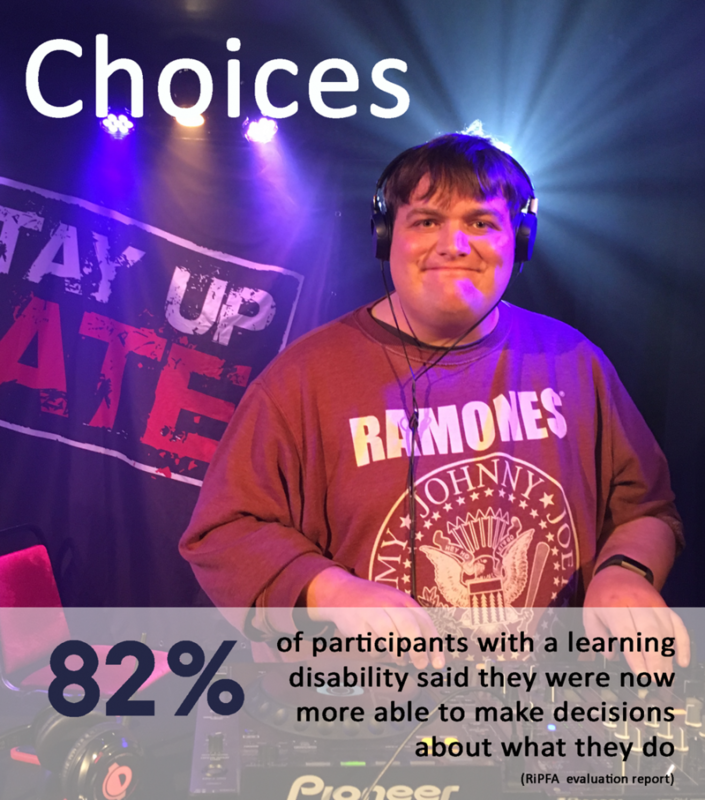 People with learning disabilities are empowered to make more choices about how they live their lives. 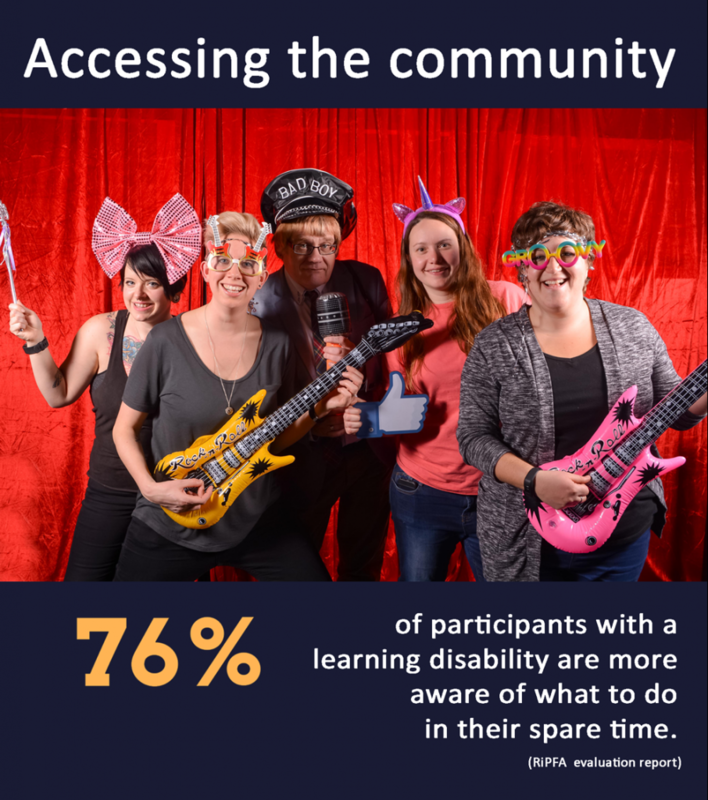 The central element of this evaluation was participatory research, which involved training Gig Buddies participants (with learning disabilities) to conduct interviews with other people who have accessed the service (these became known as‘participant researchers’). 90% of participants said they enjoyed having a Gig Buddy. 86% said they see their Gig Buddy as their friend. 82% said they felt really able to make decisions about what they wanted to do with their buddy. 76% said they’re more aware of other ways they can now spend their spare time. 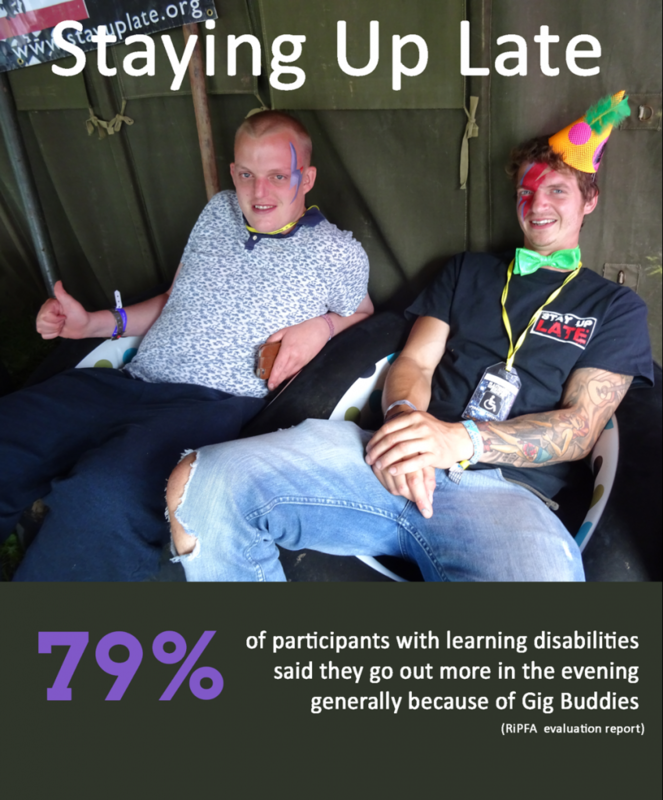 79% said they now go out more in the evenings as a result of Gig Buddies (not just with their buddy). 48% said they did feel lonely at times. 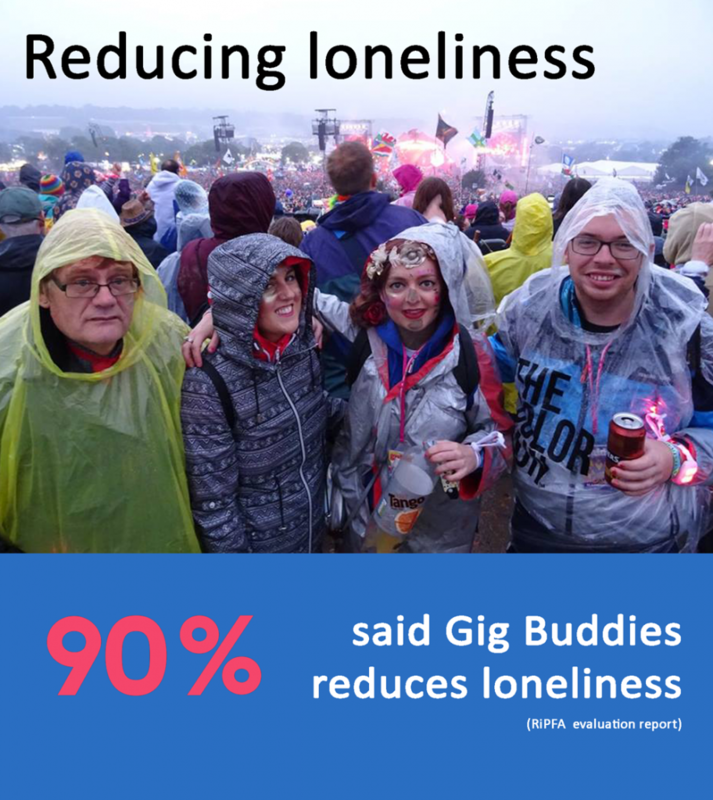 But 90% said that having a Gig Buddy makes them feel less lonely. 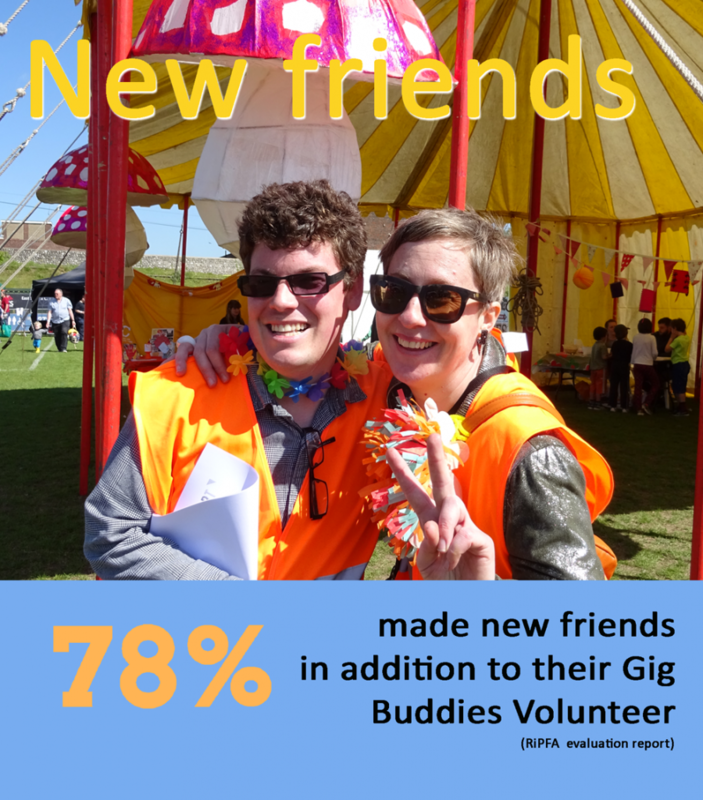 78% said they’d made new friends in addition to their Gig Buddy volunteer. That’s why we call it serious fun! If you know our staff team you’ll now they’re seriously fun people, always up for a dance and a laugh, and sometimes being talked in to the most ridiculous of situations (I’m still not allowed to talk about the all night hike). But beneath everything that they do in running the Gig Buddies project is a total commitment to supporting people to be less lonely and feel more healthy. So while Gig Buddies are going out and having a whole shed load of fun at the same time, it’s also addressing some really serious issues. That’s why we’re so we’re delighted with the findings from this research as it shows we’re on the right tracks. There’s still loads that we feel we can do and in particular the next few months will see us concentrate on our waiting lists. We have a constant stream of people wanting to have a buddy, which we see as a direct result of the severe cuts to local authority funding, and we do struggle to keep up with the demand at times. For that reason we’ve decided to pause our waiting list until 3rd Sep so we can come up with a plan to match as many people as possible. RiPFA have also helped us evaluate the sharing of Gig Buddies in other parts of the UK (and the world) and we’ll be sharing the findings from that research in the next month or so.